This is the ultimate book of Bad Poetry. In fact, it's so bad that is can hardly class as poetry! Most of the poems seem more like sentences that someone has just hit 'Enter' after random words to make it seem like poetry! Forget Shakespeare. Don't count on Donne. Shelley and Keats: banished! And there's absolutely no poet laureate from the golden or any other age. So fawning PhDs in love with little-understood verses by long-dead writers should go elsewhere. This is poetry for the rest of usbad poetry! 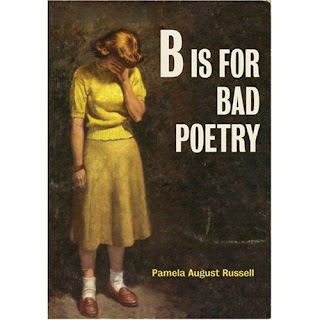 Pamela Russell's un-exalted (but thoroughly hysterical) poems mock, chide, accuse, tease, joke, undermine, point, and laugh at the world around usand at anything that takes itself too seriously. Her non-canonicaloeuvreincludes: Tea For Two (A Tragedy); Nietzsche And The Ice-Cream Truck; Capitalism Can Fall Not Like I Fell For You; Inappropriately Touched By An Angel; Love Is Like A Toilet Bowl; and many more. Who knew bad poetry could be so good! While tearing it from my head. Existenialism can be applied to anything. Evey moment is a continuous choice. What do you think. There is much much more in the book. About a 120 'poems' all up. This would make a grea Kris Kringle/Secret Santa gift for someone with a slightly sick or sarcastic sense of humour. I don't know whether to laugh or cry either, a poem about a hair? ?